So what are you doing this weekend? Well, in our house we have an annual tradition that is being upheld: it's race weekend! We will be hosting runners and walkers from hubby's side of the family and 6 of us will be participating in the festivities: 3 of us will be running the half marathon, 2 others walking the half (including hubby's powerhouse almost-70 year old mom) and the Dude will be completing his first ever kids' marathon. 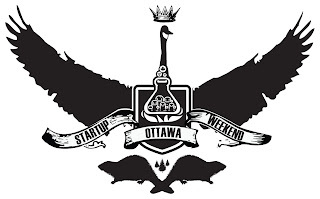 But if I wasn't doing that I would have totally been hanging out at Startup Weekend Ottawa. If you've ever done a case competition or a design jam, then you know exactly what to expect: A bunch of people pitch ideas, teams spontaneously form around the ideas and then go through the habitual storming, forming, norming and performing phases of group development in a very condensed period of time. They get to work and within 54 hours create, code, design and test their idea. And then in the delirium that ensues (largely fueled by sugar and coffee), they finish by presenting the results of their efforts to a panel of judges in hopes of winning some prizes. Who participates in such madness? Me! Well, not this one, but I competed in similar competitions when I was back in university. (Aside: If you want to hear a helluva story, ask me some time how my team was disqualified from an international case competition.) And of course, last year we hosted a Design Jam on day 2 of UXCampOttawa which saw teams design a solution to a real business problem presented by a local Ottawa business. Startup Weekend attendees’ backgrounds are roughly 50% technical (developers, coders, designers) and 50% business (marketing, finance, law). What unites all attendees is a common interest in entrepreneurship: whether a serial entrepreneur or new to the startup scene, every attendee is interested in working with a like-minded, motivated and skilled team to develop a product or business in one weekend. Isn't that awesome? So no matter what background, interests, experience, anyone has probably got some skillz they can bring to a team. Want to know more? Check out the n00b section on the Startup Weekend site. In addition to relying on one another, the participants also have the benefit of the experience and expertise of all the mentors and judges; they're real, approachable humanz who want to help teams succeed and have a lot of fun in the process. Granted, the point of the weekend is the experience: all the learning, mentoring and networking that participants will receive. The judges will offer advice on 4 aspects of the ideas: the soundness of the business model, whether there is a market for the idea, functionality (proposed or real) and execution (professionalism, user experience, etc). That's nice and all but let's face it, you probably want to know what people will win. Lots of help to get their idea off the ground: consulting, patent or trademark advice, and the like. I mean, if you come up with a fantastic idea and win the weekend, why shouldn't you try to make a go of it, right? Even if it never becomes a runaway success, imagine what you will have learned in the process. How do I find out more? Can I participate? The action starts tonight after work and wraps up late on Sunday. It promises to be an intense, frustrating, exhilarating, exhausting, rewarding experience for all involved. Did I mention that I wish I could be there? Sigh.